This CD contains 77 min. (15 tunes) of previously unreleased music, recorded live in Switzerland in 1978. Illinois Jacquet is a powerful Texas-style tenor saxophonist, with a unique style blending the sound of Lester Young and Coleman Hawkins, plus plenty of blues and rhythm & blues feeling. 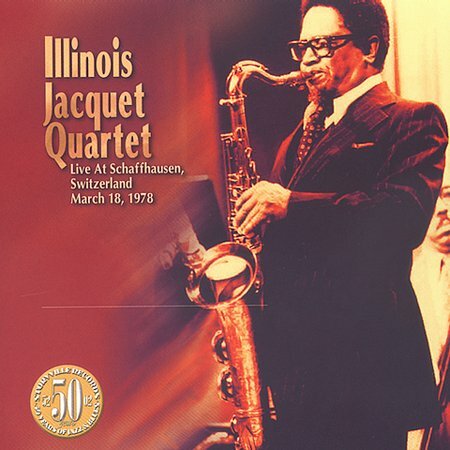 Jacquet’s rhythm section is also comprised of major jazz stars: Hank Jones, George Duvivier and J.C. Heard. The repertoire is a tasty selection of jazz standards from the book of Basie, Ellington and Hefti, among others, plus a couple of originals. The CD showcases all facets of Jacquet’s great talent: from the roaring “The King”, to the gentle warmth of “Blue & Sentimental”, to the down-home, wailing and preaching blues “Blues From Louisiana.” The rhythm section is also featured throughout the program, especially the wonderful piano playing of the Teddy Wilson-inspired Hank Jones, who has two unaccompanied solo tunes.